A combination of what makes the Original Purple mattress unique and the power to choose your comfort level makes the New Purple mattress a superior, if less affordable, Purple choice. What’s in a New Purple Mattress? What Can Be Used with the New Purple Mattress? What’s the Weight Capacity of the New Purple Mattress? Does Purple Offer a Sleep Trial, Return Policy and Warranty? How Much Does the New Purple Mattress Cost? 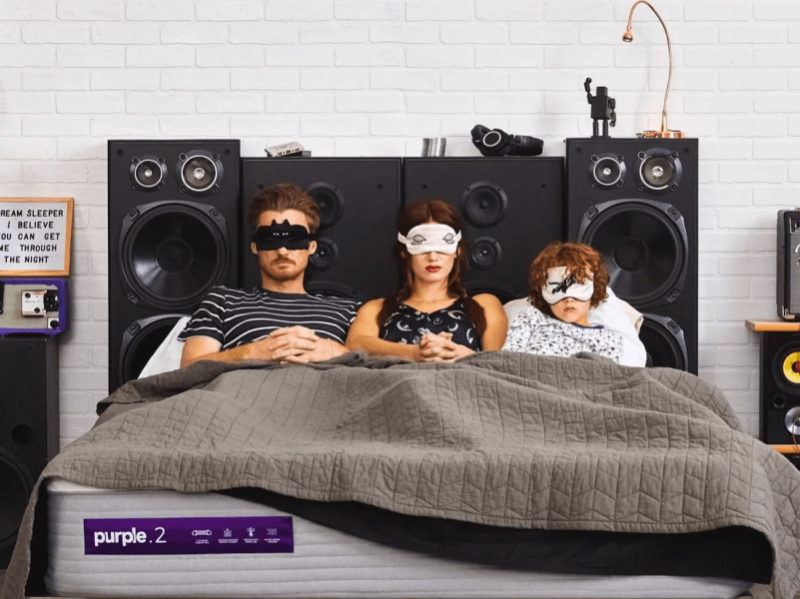 The New Purple is the latest mattress from Utah-based “sleep and comfort technology” company Purple; following the wildly successful and revolutionary flagship Original Purple. The biggest difference between the two? Both are mattresses you can easily purchase online, but the Original Purple is part of the earlier “one mattress fits all” trend. We’ve seen a wave of improved products recently featuring a way to choose a preferred mattress comfort level. The New Purple is one such mattress. What’s interesting, though, is that the release of the New Purple did not signal the retirement of the Original Purple’s design. Both New Purple and Original Purple mattresses are still on the market! Want to contrast and compare the two mattresses down to the tiniest detail? You can check out our Original Purple mattress review for reference, and then read on below for a full review of the New Purple. The New Purple mattress is proudly made in the US. In fact, the assembly of all Purple mattresses happens in Utah! Many components are manufactured there, too. All materials used in the packaging and in the construction of the products themselves are recyclable. What’s the New Purple Mattress Cover Made of? The mattress cover has also been updated from what was offered with the Original Purple. Comfort-stretch cover. Purple says that this topmost part is designed to enhance and support the benefits of the Smart Comfort Grid. It’s breathable, light, and stretchable. It’s also made of a knit fabric blend that includes polyester, polyester-lycra and viscose. Plexus side panels. These are found all around the mattress. They’re made of mesh-based material, and add extra edge support. They also increase air flow through the product. Non-skid bottom cover. This part is made of polyester only, and is much simpler than the other parts of the mattress cover. Purple recommends spot cleaning only. This mattress cover is not machine washable, as it may shrink. If you’d like to use a mattress protector, the brand also recommends using an extremely stretchable and breathable one—like their own Purple Mattress Protector (Check deal on Amazon). As for flame retardant (FR) measures, Purple notes in their FAQ that they do not use chemical treatments. During out initial research, the wording in the official website was not clear. Was the mattress cover itself fire resistant? Is there a separate fire sock in between the cover and the mattress interior? They also added that both the Original Purple and the New Purple mattresses are fitted with the same FR measures. Overall, the insides of New Purple mattress are made up of four layers. Let’s take a look at all of them below. 2-4 inches of the Smart Comfort Grid. This top layer of the mattress interior is the part that’s actually colored purple. The thickness depends on the comfort level you prefer. 0.5 inches of 2.0 density poly foam. This thin layer of CertiPUR-US approved material mostly acts as a barrier between the Smart Comfort Grid and the next layer. 7.5-inch pocketed coil system. This base layer features 13.75 gauge coils—made of 95% recycled steel and are encased in two-ply Polypropylene fabric. The edges of this layer are bolstered by more of that 2.0 density poly foam. The design choice adds to the New Purple’s improved edge support. 1 inch of 2.0 density poly foam. This bottom layer is simply to provide a foundation and springboard for the pocket coil system above it. What’s the Purple Smart Comfort Grid Made of? Purple states that the material is an patented, FDA-certified, hyper-elastic polymer. Over 30 patents serve as the foundation for this technological innovation. The grid formation allows for intelligent flex and pressure relief. Put simply, it’s firm where you need it to be firm and soft where you want it to be soft. Another benefit of the grid is that it allows for better air flow, and in turn, better cooling. To prevent the walls of the grid from sticking to each other, there is a light dusting of polyethylene copolymer. It is non-toxic and food contact-grade. Can You Customize the New Purple Mattress? Yes, you can! You have three comfort levels to choose from, and these offerings are all dependent on the thickness or height of the New Purple mattress. The New Purple’s overall thickness ranges from 11 to 13 inches. Remember when we mentioned the 2 to 4 inches of the Smart Comfort Grid layer earlier? Here’s where we explain it in detail. The New Purple.2 is 11 inches thick overall, with a two-inch thick Smart Comfort Grid. It is the firmest out of the three given levels—Purple recommends this level for back sleepers. The New Purple.3 is 12 inches thick overall, with a three-inch thick Smart Comfort Grid. It is what Purple calls the “sweet spot” that is ideal for sleepers that share the bed or change positions during slumber. The New Purple.4 is 13 inches thick overall, with a four-inch thick Smart Comfort Grid. This level is the softest, with what Purple calls a “zero gravity-like” feel. Note that customization of your mattress purchase obviously also includes choosing the size! The New Purple is offered in five standard US mattress dimensions: twin XL, full, queen, king, and California king. New Purple mattresses are much heavier than traditional hybrid foam mattresses and hybrid foam and innerspring variants. While a queen size flagship Leesa mattress is 71 pounds and a queen size DreamCloud mattress is 95 pounds, a queen size New Purple.2 is a whopping 122 pounds! Whoa. To put this in perspective: 122 pounds is the average weight of a person about 5′ 5″ tall. Consider that the New Purple.2 is already the thinnest and lightest New Purple mattress option. It outweighs many of its counterparts—even its already massive older sibling, the Original Purple. Why is weight an important consideration? Not everyone is strong and able-bodied. Imagine how hard it would be to move around something that’s the weight of a whole person—especially when the mattress cover does not have handles. Thankfully, the mattress design dictates that the New Purple not be flipped at all. Rotating the New Purple mattress every six months or so won’t hurt, though. Any firm, flat and study solid surface will do. The New Purple mattress does not need a box foundation, and is designed for a non-spring frame. Purple recommends its own platform base or adjustable power base. But unlike their mattress protector and sheets—way stretchier than others available, in order to properly support the way the Smart Comfort Grid works—there’s no deal breaking advantage to sticking to Purple products here. How Do You Set Up the New Purple Mattress? This is another part of the process where you’ll find a difference between the Original Purple and the New Purple. Shipping is free to all 48 contiguous US states for both, but the New Purple mattress also comes with complimentary White Glove Delivery. What Does Mattress White Glove Delivery Mean? It means people will arrive with the product to take care of bringing it into your home. They will also set up the new mattress properly. Purple states that they will even help you dispose of your old mattress. You can opt out of this free add-on, but we don’t recommend it! You will need all that extra help to move the New Purple mattress to the bedroom. Unlike the Original Purple, the New Purple mattress is not compressed when it is shipped and stored. Without White Glove delivery, expect it to arrive at your doorstep in all its uncompressed glory. Yes, in a flat and unwieldy box. A warning: There could be unexpected wait times due to backlog and unavoidable setbacks. We’ve seen customer feedback on Purple’s social media addressing this. The White Glove Delivery may add delivery scheduling complications. Although the official Purple website states that the home delivery of New Purple mattresses are scheduled within two weeks of online purchase, you may want to consider possible delays as a factor in choosing the New Purple mattress. You may find that you need to wait a bit for the New Purple to be delivered, but here’s the good news: You can use the mattress right away once it’s set up! Should there be a slightly sweet but faint “new mattress” smell—and we’ve seen no real feedback regarding this—just wait a few hours for it to dissipate. As all materials are recyclable and properly certified, there should not be excessive or harmful off-gassing. None, according to Purple. They do also mention that Purple mattresses easily support the equivalent of 300 pounds per side—so for mattresses for sharing, that amounts to 600 pounds total. It should be noted, though, that here at Good Night’s Rest, we’ve found that heavier sleepers typically prefer thicker mattresses—which, for the New Purple, translates to their softest variant: the New Purple.4 mattress. How Does the New Purple Mattress Feel? If you enjoy the feeling of extreme pressure relief and like to sleep cool, you’ll probable love the New Purple mattress. As with the Original Purple mattress, we’ve found as we sifted through customer feedback that positive reviews are overwhelmingly positive—almost to the point of fanaticism. Negative reviews, though few and very far between, are just as extreme. Basically, if the Smart Comfort Grid layer is not for you, you’ll know it within the first week of use. Good thing there’s a sleep trial! Another trend we noticed in the reviews is praise for the New Purple’s new and improved commitment to provide great edge support. The poly foam panels shielding the pocket coil layer has a lot to do with this, as well as the mesh side panels of the mattress cover. Purple has expanded their product line significantly since their launch: sheets, mattress protector, platform base, adjustable power base, and now even the New Purple. Now that Purple has more to offer than its flagship Original Purple mattress, there’s that added reliability and credibility that comes with the name. The brand more than just a crowdfunding darling now! It’s obvious by their trajectory that they’re building off their initial success in a solid, steady manner. We love that because we feel like Purple investing so much effort in forward thinking is a good sign that it’s not going anywhere anytime soon. How Is Purple’s Customer Support? There’s the great track record of transparency and excellent customer support to fall back on. They keep on improving, too! When we reviewed the Original Purple mattress a year ago, it came in only four standard US sizes and Purple’s official website didn’t have a live chat support option. Today, all Purple mattresses comes in five sizes—the addition was the full size—and there’s live chat support, though it’s not offered 24/7. Just a little bit of nitpicking: Remember that the response email we got back from Purple’s customer support team? It appeared in our inbox a whole three days after I initiated contact. Not exactly lightning fast, but very helpful. 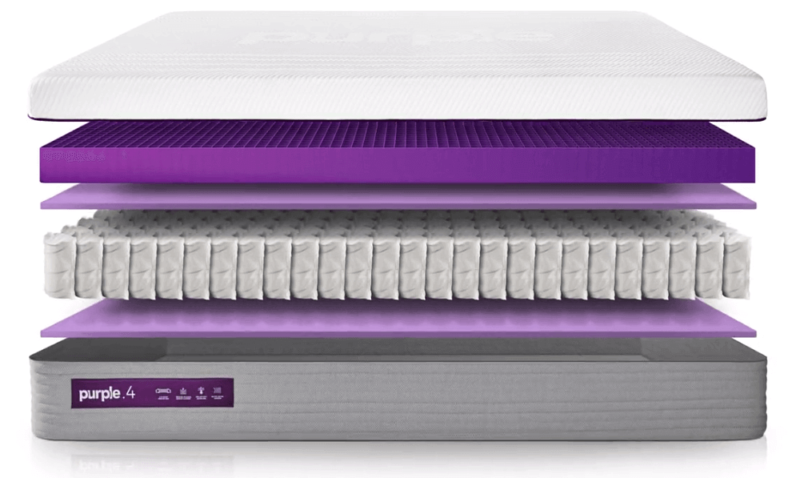 Purple offers a 100-night sleep trial, with an attached return policy that includes a full refund. Each mattress also comes with a limited 10-year warranty. The company offers a “No Pressure Guarantee” and unlike some competitors, their sleep trial period starts upon delivery and not upon purchase. Although 100 nights is by no means industry leading—more of an industry standard at this point—the fact that the trial starts one the first day you can actually sleep on the mattress is much appreciated. Want to Return the New Purple Mattress? Initiating a return is as easy as contacting the Purple support team. The company will arrange and take care of all the details of mattress pickup. They’ll even help you find a destination for it: typically a local charity or recycling facility. You will receive a full refund once Purple verifies the recycling receipt or mattress donation. Purple does not take back used mattresses. Used or already purchased mattresses that end up being returned are either donated or recycled. All their stock goes out brand new. Keeping the New Purple? Let’s talk a little about the warranty, because you’re going want to make sure not to void it. It hasn’t been 10 years yet since Purple’s founding, so there’s no real anecdotal or third party evidence to support Purple’s claim that their mattresses last for a decade. Good thing the warranty period covers the stated 10-year usable lifespan. What Can Void Purple’s 10-Year Mattress Warranty? A mix of what’s obvious and what’s unexpected make up the list of things that can negatively affect Purple mattress warranty coverage and claims. This is not a complete listing by any means! Do read the full warranty if you purchase and keep your New Purple. Unlike a traditional mattress, you should not expect a Purple mattress to last beyond its limited warranty period. This makes the warranty all the more important and useful! You don’t want to be throwing out a Purple mattress just a few years after purchase due to improper use. As of this writing, the queen-sized New Purple.2 mattress is available for $1,599—or around $97 per month if you avail of Affirm financing, though this is subject to a credit check and approval. Occasionally, Purple does offer discounts and other product freebies with every mattress purchase. New Purple mattresses are also available on Amazon. Important to note: The New Purple.2 is cheaper than the New Purple.3, and the New Purple.3 is cheaper than the New Purple.4! The thicker the Smart Comfort Grid and the softer the comfort level is, the higher the price point. The New Purple mattress is not an easy sell by any means. It’s heavier, harder to move around, more expensive, and has a shorter usable lifetime than most. And though we’re inclined to believe the brand’s claims in regarding the legal battle based on the powder used in their Smart Comfort Grid, bad press is what it is. It’s probably cost them a few customers already. However, it is true that the Smart Comfort Grid is a real innovation. The lack of a weight capacity is also an amazing claim! The New Purple’s comfort level options and pocketed coils are also great improvements. The cult-like following inspired by the Original Purple is also convincing and hard to ignore. We’ve seen many customer reviews that say the New Purple is a personal upgrade from the Original Purple. This means that they didn’t need to change mattresses yet, but they wanted to. Wow. The bottom line? Try the New Purple if you’re the type to support innovation and future-facing technology, and you’re not on a tight budget. You can try it out risk-free for 100 nights! And you can always return it if the New Purple ends up being not for you.